Picture - The prototype DH.91 Albatross, G-AEVV, over Hatfield, September 1938. Photo- Flight International. The de Havilland DH.91 Albatross was a four-engine British transport aircraft in the 1930s. A total of seven aircraft were built in 1938-1939. The DH.91 was designed in 1936 by A. E. Hagg to Air Ministry specification 36/35 for a trans-Atlantic mail plane. The aircraft was remarkable for the ply-balsa-ply sandwich construction of its fuselage which was later made famous in the de Havilland Mosquito bomber. The first Albatross flew on May 20, 1937. The second prototype broke in two during overload tests but was rebuilt and it and the first prototype were used by Imperial Airways. Although designed as a mailplane, a version to carry 22 passengers was developed; the main differences were extra windows and the presence of slotted flaps in place of the split type. Five of these made up the production order delivered in 1938/1939. As normal for the Imperial Airways fleet of the time, all were given names starting with the same letter, and the first aircraft's name was also used as a generic description for the type overall, as "Frobisher Class". This tradition, which came from a maritime and railway background of classes of ships and locomotives, lasted well into post-war days with BOAC and BEA. The first delivery to Imperial Airways was the 22-passenger DH.91 Frobisher in October 1938. The five passenger carrying aircraft were operated on routes from Croydon to Paris, Brussels and Zurich. After test flying was completed the two prototypes were delivered to Imperial Airways as long-range mail-carriers. The only significant season of their operation was the summer of 1939, when they were the main type on the two-hourly London Croydon to Paris Le Bourget passenger route. With the onset of World War II, the Royal Air Force considered their range and speed useful for courier flights between Great Britain and Iceland and the two mailplanes were pressed into service with the 271 Squadron in September 1940. Both aircraft were destroyed in landing accidents in Reykjavx�k, one (Faraday) in 1941 and one (Franklin) in 1942. The five passenger aircraft were used by Imperial Airways (later BOAC) on Bristol-Lisbon and Bristol-Shannon routes. One aircraft Frobisher was destroyed during a German air raid on Bristol in 1940, and two in landing accidents, one (Fingal) in 1940 at Pucklechurch and the other (Fortuna) in 1943 at Shannon Airport. With only two aircraft surviving Falcon and Fiona were scrapped in September 1943. Faraday Mail carrier variant was delivered to Imperial Airways in August 1939 as Faraday and registered G-AEVV. it was transferred to BOAC when it was formed in 1940 but was impressed into Royal Air Force service with the serial number AX903 for operation by No. 271 Squadron RAF. It was destroyed after a landing accident at Reykjavik on the 11 August 1941. Franklin Mail carrier variant was delivered to BOAC as Franklin and registered G-AEVW. Impressed into Royal Air Force Service with the serial number AX904 for operation by 271 Squadron. It was destroyed when the landing gear collapsed on landing at Reykjavik on the 7 April 1942. Frobisher Passenger variant was registered G-AFDI and delivered to Imperial Airways (later BOAC) as Frobisher in 1938. It was destroyed on the ground during a German air attack on Whitchurch Airport on 20 December 1940. 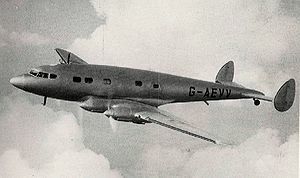 Falcon Passenger variant was registered G-AFDJ and delivered to Imperial Airways (later BOAC) as Falcon in 1938. It was scrapped in September 1943. Fortuna Passenger variant was registered G-AFDK and delivered to Imperial Airways (later BOAC) as Fortuna in 1939. Destroyed in a crash landing near Shannon Airport, Ireland on 16 July 1943. Fingal Passenger variant was registered G-AFDL and delivered to Imperial Airways (later BOAC) as Fingal in 1939. Destroyed in a crash landing near Pucklechurch, Gloucestershire, England on 6 October 1940. Fiona Passenger variant was registered G-AFDM and delivered to Imperial Airways (later BOAC) as Fiona in 1939. It was scrapped in September 1943. Kopenhagen, Wolfgang (editor) (1987). Das grox�e Flugzeug-Typenbuch. Transpress. ISBN3-344-00162-0. Jackson, A. J. (1987). De Havilland aircraft since 1909. Naval Institute Press. ISBN0-87021-896-4. Jackson, A. J. (1973). British Civil Aircraft since 1919, Volume 2 (2nd edition ed.). Putnam. ISBN0-370-10010-7.